When 7pm strikes and Molly is tucked away in her little room, often the very last thing I feel like doing is cooking dinner. Don’t get me wrong, I really enjoy cooking and all that, but I don’t always find it easy to summon the energy to start from scratch in order to make something that gets wolfed down in about 8 minutes. However, I’m quite a happy bunny when I can get it made a lunchtime whilst the little one naps. One of our absolute favourite dishes and a regular on the weekly dinner menu a la Shaw is a Salmon and cous cous combo that is packed FULL of flavour. So, I thought I’d share the recipe with you for a quick and easy supper. Yum. Pre-heat the oven to 400 F. Place the cherry tomatoes into a baking pan, liberally drizzle with olive oil and season with salt and pepper. Pop in the oven for around 15-20mins or until nice and squidgy and yummy looking. Meanwhile boil the kettle to make 1/2 cup of chicken stock. In a large-ish bowl combine the cous cous and the chicken stock. Cover and leave to rest for 5 mins. Whilst it’s working it’s magic in the bowl chop the spring onions, whites only. Check the tomatoes. Once done, reduce to over temperature to 350 F.
Once the cous cous has absorbed all the stock, add the now cooked tomatoes, spring onions, garlic, juice and rind of 1/2 a lemon and stir to combine. Season with salt and pepper to taste. 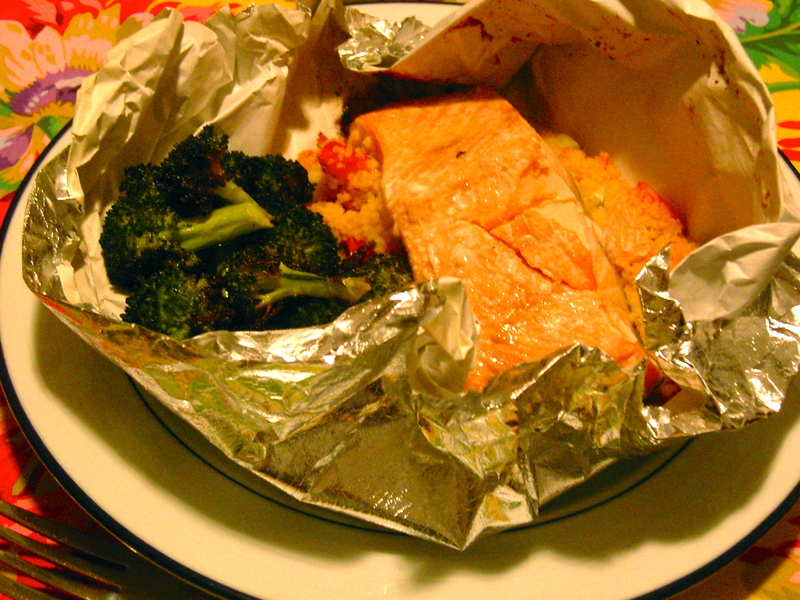 I found this magical foily-parchmenty type thing that is foil on one side and parchment on the other…but…it’s just as easy to use foil and parchment paper (baking paper) separately. Cut 2 large squares of foil. Cut more than you need because you’ll need more than you think you’ll need. Then cut two small pieces of parchment paper. These will sit in the middle of the foil packets and provide a non stick base for the cous cous. Divide the cous cous between the two packages and top with a salmon filet. Before sealing the packet pour 1 tbsp of soy sauce over each piece of salmon. Seal packages and pop onto a baking tray. Bake at 350 F for about 20 minutes. Don’t be scared to have a sneaky peek to see if they’re done earlier, especially if you like your salmon a bit pinker. I served ours with roasted broccoli. Delish. And the best part….no plates to wash! Hurrah! Yum. Dinner, tonight, sorted. Enjoy! 08 Jan	This entry was published on January 8, 2013 at 7:09 pm and is filed under Uncategorized. Bookmark the permalink. Follow any comments here with the RSS feed for this post. Older: …and in with the new!